Japanese Industrial Production decreased more than expected in July. US Retail Sales are foreseen to have grown in August, USD/JPY could break higher. 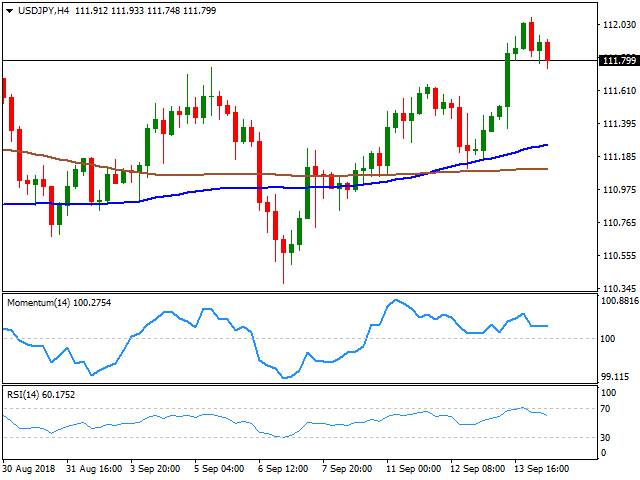 The USD/JPY pair eases after peaking at 112.07 during the Asian session, now trading at daily lows around 111.80. Risk appetite that run healthy through Thursday helped the pair reached such high, alongside with poor Japanese data, both weighing on the safe-haven currency. The country's Industrial Production fell by more-than-expected in July, printing -0.2% MoM, while yearly basis, it was up 2.2%, below the market's forecast of 3.1% and the previous 2.3%. Capacity Utilization in the same month fell 0.6% vs. the forecasted 0.0%. In the meantime, equities in Asia were sharply up, and European ones are following suit, although the momentum seems to be fading. US Treasury yields, usually a market motor for the USD/JPY pair, are up, but the pair is so far ignoring it. The US will release today August Retail Sales expected to have grown in August at a similar pace than in July, after a downward kneejerk in June. The 4 hours chart for the pair shows that it continues developing well above its 100 and 200 SMA, both gaining upward traction, some 50 pips below the current level while technical indicators keep retreating from overbought readings, but remain well into positive territory, all of which limits the downside potential of the pair, at least as it holds above the 111.40/50 region, a former resistance. A break through 112.15 should lead to a steeper advance which can extend up to 113.17, July's high.